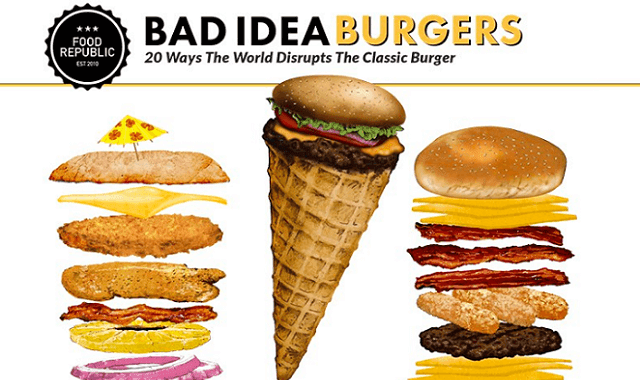 Bad Idea Burgers: 20 Ways The World Disrupts The Classic Burger #Infographic ~ Visualistan '+g+"
Burger purists hate ’em. Guy Fieri stuffs them in his big mouthhole. How do you feel about gimmicky burgers? As we kick off a week devoted to mouth-watering burger recipes, interviews with chefs and burger experts, as well as exclusive excerpts from the most exciting new burger books, let’s take a look at the ways people around the world have used the burger as a palette for bizarre ingredient expression. Love ’em or loathe ’em, here are 20 Bad Idea Burgers!